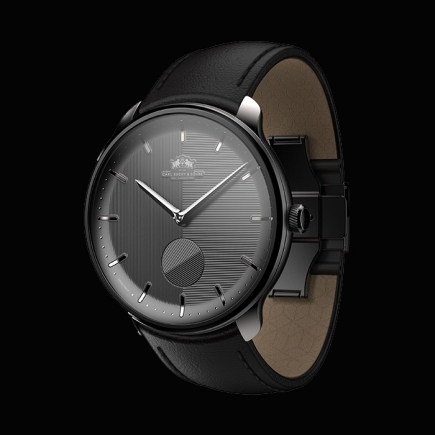 Carl Suchy & Söhne | 19'650 € Tax inc. 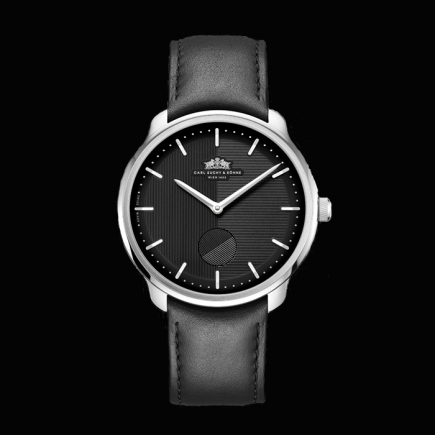 Founded in 1822 by Austrian watchmaker Carl Suchy, the renowned watch brand counted the likes of Emperor Franz Joseph, Empress Sisi and Sigmund Freud amongst his distinguished customers. 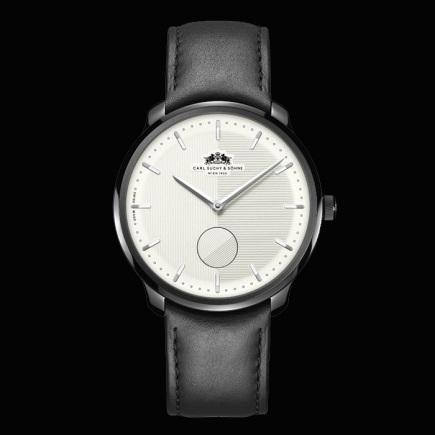 After one century as the sole watchmaker for the Habsburg royalty, Carl Suchy & Söhne disappeared with the demise of the Austro-Hungarian Empire. In 2017, the brand has revived in Basel. The Viennese legacy brand returns in 2018 with the Waltz N°1 Skeleton. 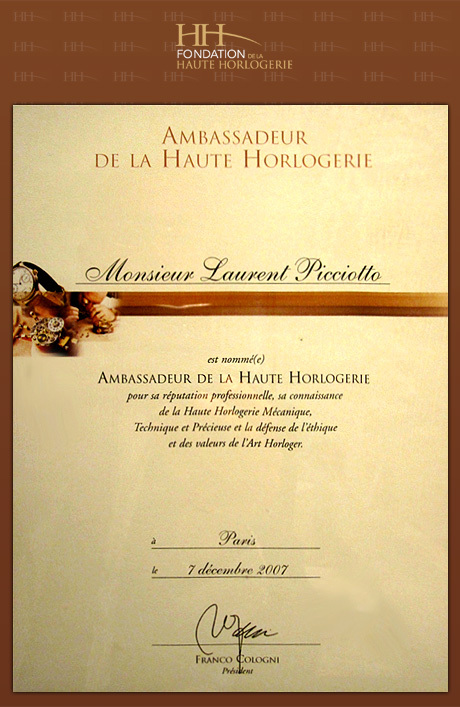 It is equipped with a skeletonized extra-flat automatic movement by Vaucher Manufacture Fleurier, modified by Swiss watchmaker Marc Jenni, a former member of the Académie Horlogère des Créateurs Indépendants (AHCI). 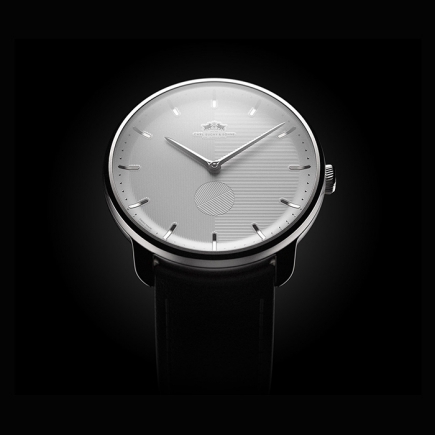 The subtle lines and classic dial of the Waltz N°1, as well as its straight guillochage, were inspired by the avant-garde and minimalist style of to most important Austrian architect of Viennese modernism, Adolf Loos. 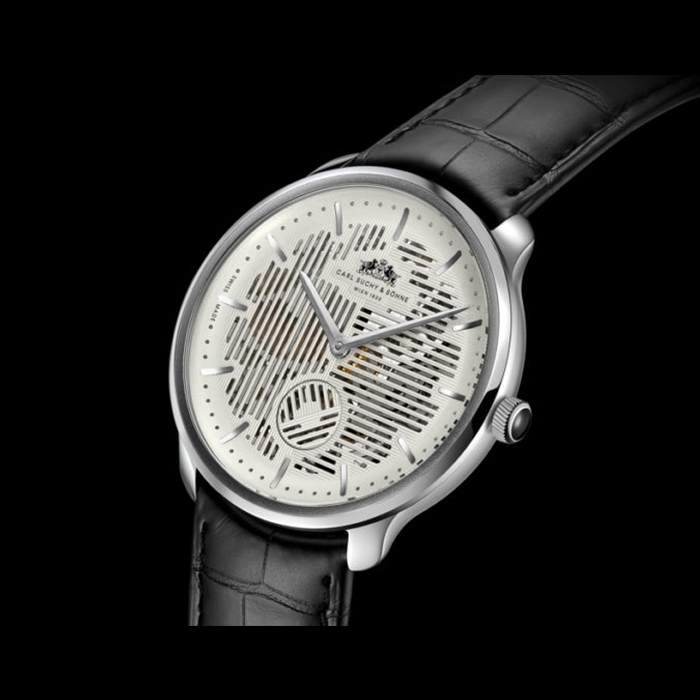 Honoring the brand’s DNA, the skeletonized dial of the Waltz N°1 Skeleton is animated by the rotating « waltzing » second disc at 6 o’clock featuring a striped guilloche-pattern that aligns with that of the dial once a minute. The Waltz N°1 Skeleton’s pure lines and classic dial were inspired by the minimalistic aesthetics of Austrian architect Adolf Loos, a precursor of Viennese Modernism. The Waltz N°1 Skeleton plays with the juxtaposition of revealing and hiding. 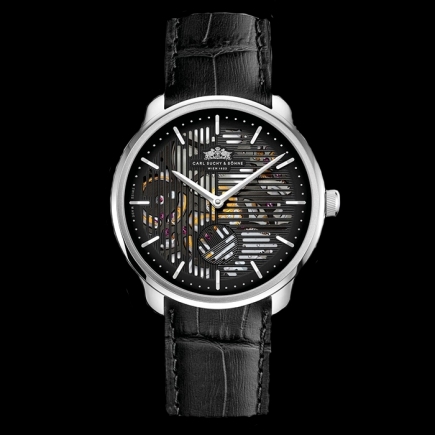 The uniquely open-worked 41,5mm dial reveals just enough to anticipate the sophistication of its skeletonized ultra-thin automatic movement, while its aesthetics retain the brand’s fundamental visual identity. 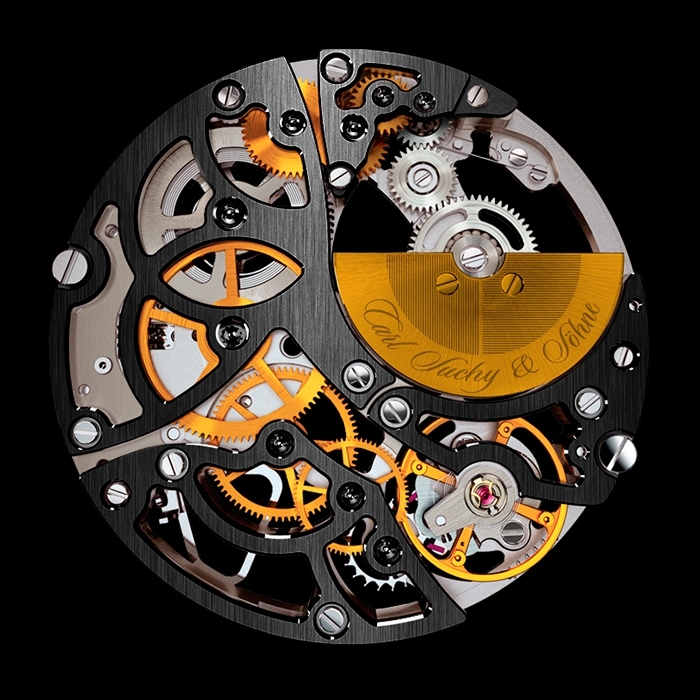 The bridges and angles of the ultra-thin skeleton automatic movement VMF 5401/180 by Vaucher Manufacture Fleurier were finished by the hands of master craftsmen. 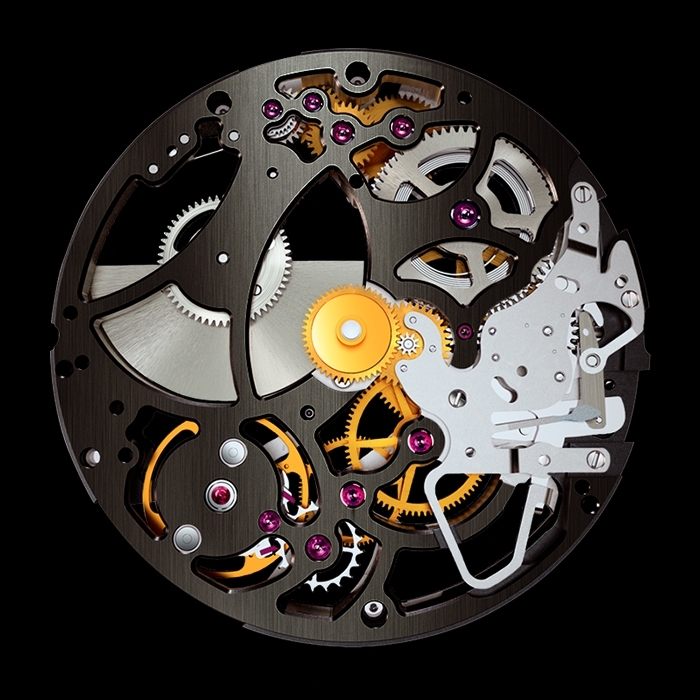 Visible through the sapphire-glass case-back, the movement is powered by an expertly nished decentralized micro-rotor. - Rhodium-plated and hand-finished plate and bridges. 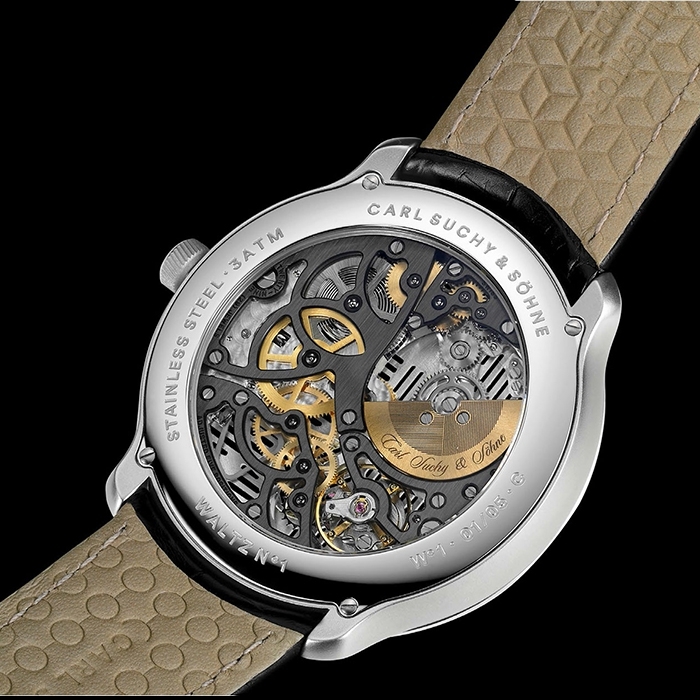 - Adjustable steel folding clasp engraved with the „Carl Suchy & Söhne“ emblem.